Set yourself apart from the standard rectangular card with a die-cut shaped business card! Guaranteed to make your branding stand out, we have a wide variety of pre-made shapes for you to choose from. Ranging from rounded corners to classic tickets, bite marks to bubbles, we have something to boost your brand. We are always looking to help you find the most unique Business Cards at the best prices, which is why there are no setup fees for any of our pre-made shapes. Simply download the template or use our Online Creator to create your design and upload the file to your order! Order your Custom Shaped business cards in Vancouver today! Bite Mark - 3.5" x 2"
Pricing and ordering of this unique product is available via Print Quote. 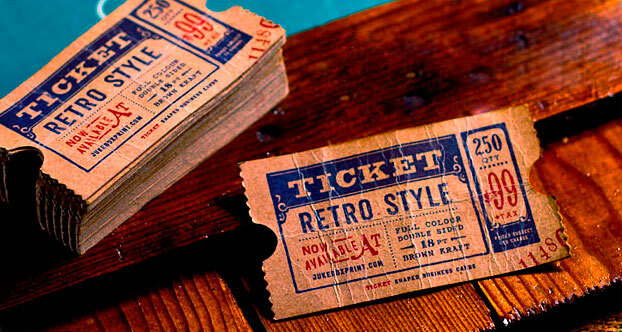 The sample above shows a Dark Brown Kraft (Retro Ticket shape) Distressed texture card with full-colour printing. We have a collection of pre-made shapes for business cards, hang tags and gift card holders. If you would like to create your own shape, you can do this via a custom order. You will need to submit a Custom Quotation form in order to receive a quote from our Print Estimations team. Be sure to provide as much information (i.g. stock, coating, quantity, etc.) and to supply all necessary files, such as a dieline, to receive an accurate quote. Please note that producing your own shape will cost more than ordering one of our pre-made shapes as there are added fees included to produce the order. A custom shape is any product that is cut into a unique shape (or that is not a rectangle / square). What is the best size for a circular business card? How will the card be used? How will you carry the business card? Who will receive your business card – and how will they carry/store it? Does it need to fit a Business Card holder? Certain larger sizes of circular cards may not fit into a standard wallet. A unique size and shape is a great way to make an impression and be memorable – but you also don't want a card that is impractical and ends up being discarded. What content will be on the card? While you want a circular card to be small enough to be practice, it also has to be large enough to fit the information that you want on the card at a legible size. It is a fine balance. There is no standard size for circular business cards – it is dependant on your needs and what you want your card to say. We offer several circular shapes as Pre-made shapes (in increments of 0.5" from 1" to 4" diameter). Our recommended size for Circular Business cards is between 2" to 3.5" in diameter – with 3" generally being the most popular and practical. Can I change the corners that are rounded? For example if you ordered 1 corner rounded; it can be any of the four corners. Remember when setting up your design to take into consideration how the card is flipped; see: Orientation. If you need to change the number of corners that are rounded, the configuration (such as 2 corner same-side to 2-corner adjacent) or corner radius, your order details will need to be changed. Please contact our Customer Service team if you need to change the details of your order. We have a wide range of pre-made shapes available on our Shaped business cards page, but if you would like to create your own shape, you can do this via a custom order. You will need to submit a Custom Quotation form in order to receive a quote from our Print Estimations team. Be sure to provide as much information (i.g. stock, coating, quantity, etc.) and to supply all necessary files, such as a dieline, to receive an accurate quote. We can create almost any custom shape you would like, from small business card shapes to larger flyers, and even custom shaped posters!
. A dieline is never printed, so make sure to place it on a separate layer and to not export it with your artwork (unless you are providing a mockup file). Its main purpose is to indicate how your product will be cut and knowing this will allow you to decide how to design your finished piece. A dieline is used as a guide to assist in proper file preparation for printed products that require die cutting. A dieline is never printed, so make sure to place it on a separate layer and to not export it with your artwork (unless you are providing a mockup file). Its main purpose is to indicate how your product will be cut and knowing this will allow you to decide how to design your finished piece. Standard - 3.5" x 2"Oversize - 3.5" x 2.25"Oversized - 3.5" x 2.5"Mini - 3.5" x 1.25"Mini - 3.5" x 1.5"Mini - 3.5" x 1.75"2.25" x 2.25"2.5" x 2.5"2" x 2"Bite Mark - 3.5" x 2"Boutique - 3.5" x 2"Curly Bracket - 3.5" x 2"Elegant - 3.5" x 2"Lips - 3.5" x 2"Retro Lounge - 3.5" x 2"Bubble - 3.5" x 2"Speech Bubble - 3.5" x 2"Squeeze - 3.5" x 2"TV Tube - 3.5" x 2"Circle - 0.75" DiameterCircle - 1.5" DiameterCircle - 1" Diameter Circle - 2.5" DiameterCircle - 2" DiameterCircle - 3.5" DiameterCircle - 3" DiameterCircle - 4" DiameterTicket (Retro) - 3.5" x 2"Ticket (Classic) - 3.5" x 2"Ticket (Admit One) - 3.5" x 2"Oval - 0.85" x 2" Oval - 1.5" x 2"Oval - 2.5" x 3" Oval - 2.25" x 3" Oval - 2.75" x 4"Oval - 3" x 4"Oval - 4" x 5" Oval - 5" x 6" Mini Bent Oval - 1.75" x 2.64" Bent Oval - 3.578" x 2.3"Bread Slice - 2.35" x 3.35"Cork - 2.078" x 3.292"Ribbon - 2.342" x 3.592"Mini Elegant - 2.3" x 1.73" Mini Heart - 1.75" x 1.5"Oval - 2.25" x 3.5" Shear - 3.7" x 1.4" Mini Squeeze - 2.292" x 2.035"